Sometimes you’ll need to synchronize and integrate Common Data Service data with data that is stored in other systems. The common data integration patterns include taking data from an external system and pushing it into Common Data Service, taking data from Common Data Service and synchronizing it to some external data store, or updating Common Data Service with external data. You can now use several new capabilities to make it easier to write code to achieve these scenarios. These new features can be used separately as needed in any situation, but together they address common issues related to synchronizing and integrating data with external data. The following table introduces these new features. Alternate Keys In enterprise deployments of Common Data Service, it’s common for data from external enterprise systems to be loaded into Common Data Service so that it can be presented to users. These external systems often can’t be extended to store the Common Data Service record identifiers, known as GUIDs, required for system synchronization. A common solution is to add a custom attribute to an entity in Common Data Service that can be used to store the identifier of the related record in the external system. 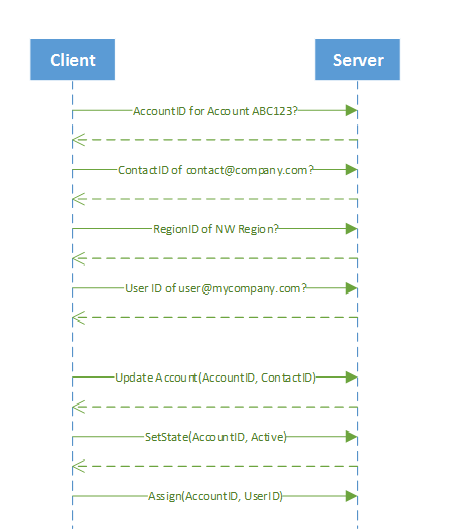 When you build data load processes that update records in Common Data Service and assign references to related records in Common Data Service, you first have to make an extra Common Data Service web service call to retrieve the target Common Data Service record based on this external identifier. This lookup can be slow if an appropriate index is not in place for the custom attribute, and in Common Data Service scenarios, each of these lookups requires a costly round-trip across the Internet. These extra round trips can increase by an order of magnitude the time it takes to update each Common Data Service record and can reduce overall throughput drastically. Change tracking When organizations need to maintain Common Data Service data in external storage there is now a way to keep that data synchronized in a performant way by detecting what data has changed since the data was initially extracted or last synchronized. The RetrieveEntityChangesRequest message is used to retrieve the changes for an entity. See Use change tracking to synchronize data with external systems for more information. The following table compares the complexity of synchronizing with and without these new features. 2. Query the contacts to verify that the contact exists. If it exists, get the email ID of the contact (for example, contact@company.com). 3. Query to get or set the region ID (for example, NW). 6. Set the state of the account by calling the SetState API. 7. Assign the owner by calling the Assign API. Now, with the new features, it just takes one call to the server to perform the same operations as previously shown. Just one call to verify that there is an account with the unique ID ABC123, set the primary contact to contact@company.com, set the region to NW, set the owner to user@mycompany.com and the status to active.